Be it in the Netherlands, Poland, Sweden, or another European country, ArcelorMittal’s steel is used to build many bridges throughout Europe and across its borders. 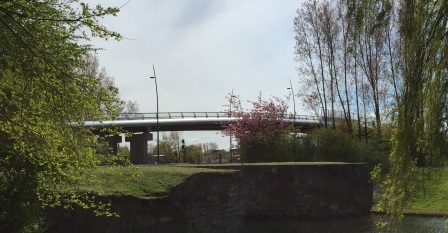 This time, it is in France that a bridge was built with our steel, with all the beams provided by ArcelorMittal Eurostructures Beam Finishing Centre in collaboration with ArcelorMittal Distribution Solutions. Next to Dunkirk, the gateway linking the towns of Petite-Synthe and Fort Mardyck to Saint Pol sur Mer has been closed to traffic for 5 years. The old bridge, made of reinforced concrete, was built in 1977 and demolished in 2011 for safety reasons due to one of its supports being damaged. To build the new Triangle bridge, the best solution was to opt for a concrete-steel mixed structure. The new bridge is composed of a weatherproof concrete floor slab with acoustic insulation. Steel was chosen for the support beams due to its efficiency and for its aesthetic and economical properties. S460M steel is economically beneficial for that type of application. 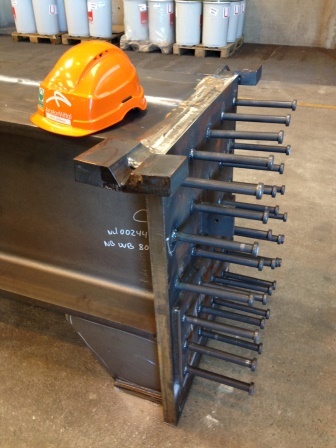 Indeed, the weight of the structure can be reduced with a low price increase, its carbon rate is very low and welding doesn’t require pre heating. Eurostructures in Luxembourg was chosen by the customer Eiffage TP to provide 32 metre-long HEB and HEM 600 beams. Eiffage TP is well-known for realising prestigious civil engineering structures (the Millau Viaduct, the Montparnasse tower, the Channel Tunnel …).